Last week was a super week. We made our last long trek to Dallas to SIRM. We graduated! Dr. S. was as excited as we were. He gave us a letter and a copy of our chart for us to give my OB-GYN. I've decided to stick with Dr. R in Shreveport as my OB-GYN. I really like her! She is just so caring, and I trust her. Even though I have my doubts about having an OB-GYN that is two hours away when it comes to delivering, I'm sure we can make it work. Nausea has reared its ugly head in my world this week! The first few mornings, it came on just as I first got up in the mornings. By the time I was driving to work, the nausea had turned to hunger. Yesterday was different. The nausea stayed and stayed and stayed. All day. There were moments during the day I was nauseated AND hungry! How that happens, I don't know. I ate small meals throughout the day, and it seemed once I would eat, I'd feel alittle better. Today, I haven't been nauseated at all. The acid reflux isn't nearly as bad as it has been. I get tired and winded easily, so I take lots of breaks and alot of naps. I want to start walking, but it's so hot outside! I really need to get some exercise. All of my pants are tight, but I know it's too early to start wearing maternity pants. I've got a few things picked out online, but I haven't ordered yet. I'm having a hard time finding cute maternity things. Thursday was a big day for me! 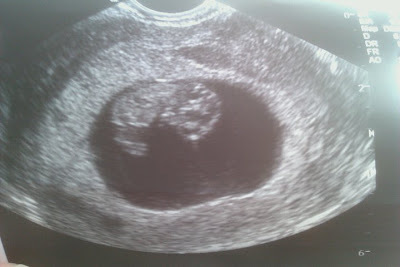 Not only was it my six week mark, but I had my first ultrasound. We were able to see our precious little jelly bean! One perfect baby! We were even able to hear the heartbeat. Mom and K were both there, and we shed lots of happy tears. I couldn't take my eyes off of the ultrasound screen. It was by far the best day of my life, and I am so grateful to the Lord for bringing me here. I never thought this would happen to me, and I'm doing my best to savor each and every moment. It's hard sometimes, and fear so easily slips in. I know that our struggle has tainted me to a point. That fact makes me angry. I know the next coming months that are normally joyous and exciting for most pregnant women will be largely consumed with fret and worry for me. I'm being pro-active against this fret and worry though, and I'm determined to not allow it to take over and rob me. As an act of faith, I made my pregnancy public on Facebook this week. It was a blessing to have so many encouraging comments! Just knowing that we've had so many people praying for us and this miracle makes my heart full. This week will be another milestone week. We're going to Dallas this Wednesday for our second ultrasound to make sure our sweet jelly bean is growing, growing, growing! I can't wait to hear that heartbeat again. And it will be nice to see everyone at the clinic. I miss them!